Everyone loves playing with the old alphabet magnets on their refrigerator - writing out clever messages or children just learning their ABCs. But taking around your fridge to write a little message or pass some time is just a bit impractical - until now. 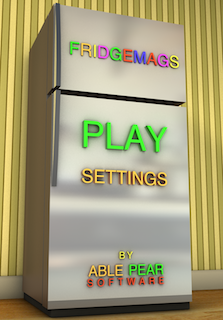 Fridgemags is a refrigerator in your pocket complete with magnets. Starting with the ABCs and a few extra vowels and consonants you can spell messages and save them to your photos to email to friends. With Fridgemags young children can interact with their ABCs and are instantly engaged with and audible, visual and tactile experience. Fridgemags is great for for anyone and available in the App Store. Universal Application—works on iPhone, iPad and iPod touch. Letter Viewer—lets you know which letter you have selected.